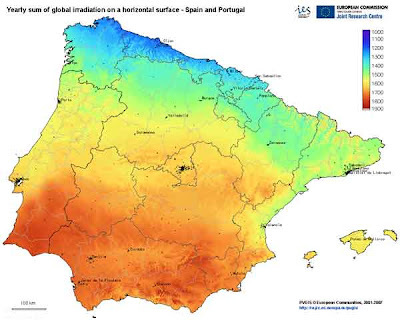 Portugal is one of the European countries with the highest levels of solar radiation (particularly the Alentejo region), enjoying excellent conditions for photovoltaic conversion with generating indices of about 1500 kWh/year for each installed kWp (in optimal conditions). 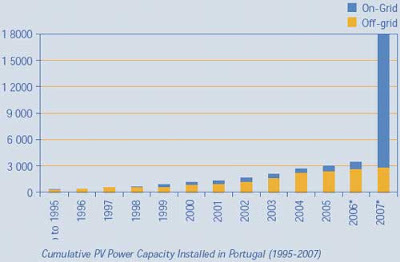 For example, in terms of average annual number of hours of sun Portugal varies between 2,200 and 3,000 h, while Germany varies between 1,200 and 1,700 h.
As we can note, the Portuguese PV market increased strongly in 2007, from a cumulative power of 3,4 MWp to 17,8 MWp, due to the completion of the mentioned power plants. A 46,4 MWp (62 MWp) single-axis tracking system centralised PV plant in east Alentejo (Moura municipality), promoted by the local Municipality and Acciona Energia (Spain), is expected to be completed by the end of 2008. There is also a great potential for integrated systems in buildings (BIPV). This can lead to a creation of a sustained market - the installation of 1.5 kWp systems in new buildings could result in an annual potential of 60 MWp. Open Renewables, Lobo Group: produced high quality photovoltaic modules on an exclusive basis for Siemens Solar, from 1994 to 2001 and for Shell Solar, from 2001 to 2006. It is an independent producer since 2007, currently with an installed capacity of 45 Mwp and about 950,000 units produced since 1994. It exports 99% of production to 19 countries in Europe, North America, Africa and Asia. Solar Plus: manufacturers of photovoltaic modules in amorphous silicon, 2nd generation. They initiated a pilot phase of production in late 2007 with initial capacity of 5.5 MW expandable to 11 MW. Investhome, DST Group: manufacturers of photovoltaic modules in crystalline silicon. Martifer Solar: manufacturers of photovoltaic modules in crystalline silicon. They began the construction of a production unit that will be ready by the end of 2008 with a capacity of 50 MW per year. This production unit will have the capacity to double the production in a short space of time and will be fully automated. WAS Energy: manufacturers of optical equipment and tracking for photovoltaic systems based on their own patents. The WAS Energy has a production line at the Taguspark. A module assembly factory will be installed in the Moura Project, which will be described with more details in the next article of this series, focusing on photovoltaic solar. There is also an industry of power electronics and good installers in the market. It was created a Technical committee of Photovoltaic standardization (CTE 82) for monitoring the European and international standards. Fundamental research activities are carried out in a dozen public institutes and university R&D units mainly in the area of thin film technologies, crystalline silicon ribbon and organic cells. 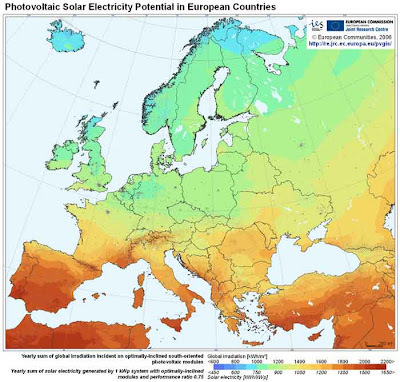 The EU objective is to achieve, by 2015, the competitiveness of PV with the cost of electricity to consumers of 0.15 € / kWh (or a cost of the system of 2.5 € / Wp). To obtain these goals it is necessary to create new materials and manufacturing processes, reducing the cost; improve the performance of BOS (balance of system) components; acting in the field of Standards and Quality and in the social area. Some benefits include the creation of jobs associated with market promotion and evolution of PV. The investment in the area of photovoltaic systems can create companies of manufacturing, engineering, installation and maintenance and employment with a particular focus at the local level. Manufacturing: 7 jobs per MW produced. Engineering and Installation: 30 jobs per MW installed. Maintenance: 2 jobs per MW installed. In 2001, Portugal assumed a goal in the promotion of renewable energies. Within the framework of the European Parliament and the European Council Directive 2001/77/CE, the country undertook to increase renewable energies' contribution to 39% of annual gross electricity consumption by 2010. In order to reduce energy imports by substitution with local renewable sources, fight climate change and reduce greenhouse effect gases emissions (GEE), the actual Government reviewed the goals defined in Cabinet Resolution 63/2003: increase the goal set for 2010 for power generation based on renewable energies from 39% to 45% of total electricity consumption. Solar energy: construction of the world's largest photovoltaic plant (the Moura plant) and ensure link to micro-generation policies. The Moura Photovoltaic Power Station represents about 30% of the objectives of photovoltaics in Portugal (national target of 150 MW). Micro-generation: program for installing 50,000 systems until 2010, with incentives to the installation of water heating systems based on solar energy in existing houses. This program could create new business opportunities for installers, industry and energy service companies, stimulating the market of renewables. The micro-generation program is mainly oriented to electricity consumers. The special regime applies exclusively to renewable sources (solar PV, wind, hydro, biomass and fuel cells) with the maximum of interconnection power by application limited to 3,68 kW (solar PV national target of 22 MW). another but symbiotically accomplish each other. when producing a larger quantity of energy." So the combination of photovoltaic solar with solar-thermal plants, as a whole of the same structure, is also very important. Viva Portugal. Perhaps it will provide inspiration to the rest of the world on how to wean oneself from the addiction of fossil fuels and carbon dioxide emissions which in Portugal alone have risen 34% since 1990, among the fastest increases in the world. But Viva Spain too! It has the world’s largest solar power park completed in January 2008 — Parque Solar Hoya de Los Vincentes — in the Jumilla province. At capacity, the park’s 120,000 solar panels can produce 23 megawatts of electricity. Hoya sits in an area roughly 100 hectares long and contains a constellation of 200 photovoltaic solar plants. Each plant has 100 kW capacity. Perhaps the most impressive feat though is how quickly the park was built –only 11 months. And viva San Francisco future solar city in construction since 2001. Two solar projects have been in the works in San Francisco that will provide enough electricity for 60,000 homes in the Bay Area. When fully operational, the plant will be the world’s largest solar facility. The first phase of construction, which includes 675kW installed solar power capacity on the Moscone Convention Centre, is already complete. Ultimately, the plant will be 50MW solar power facility has begun, with 140 to 250 acres of photovoltaic panels being installed on commercial, residential and government rooftops. Another 10MW to 12MW of solar power will come from an agreement linked to 30MW of wind power, costing $100 million. This involves photovoltaic panels being fixed to city facilities and buildings. So, to answer the question on today's cover: it would appear that the idea is as bright at the sun itself. If nothing else they inspire hope for a brighter future for mankind accompanied by spiritual and not just material progress. Indeed, hope prings eternal! One explanation for that rise is probably that the portuguese always REFUSED to have nuclear plants. Now (for some time now, actually) people are trying to fix it by using alternative energy sources. I remember my parents' neighbours installing roof flat modules for solar energy since the eighties... it's not such a new thing. Simply they became more efficient, people became more aware, governments became more aware and pressured, and solar-thermal spread as well. ps - California, as a whole, should invest quite much on it, as well as Texas, New Mexico, Colorado, Arizona, Nevada, Utah, etc... maybe even Florida, the Carolinas, Georgia and Wyoming. When is it gonna be Los Angeles, Las Vegas, Phoenix, Dallas, San Antonio, Miami or Fort Lauderdale?